Nearly three-quarters of people in the United Kingdom (73%) say they would like to see some powers currently held by the European Union returned to national governments, according to a new Pew Research Center study. At the same time, a majority of British adults (62%) say membership in the EU has been a good thing for their nation’s economy. 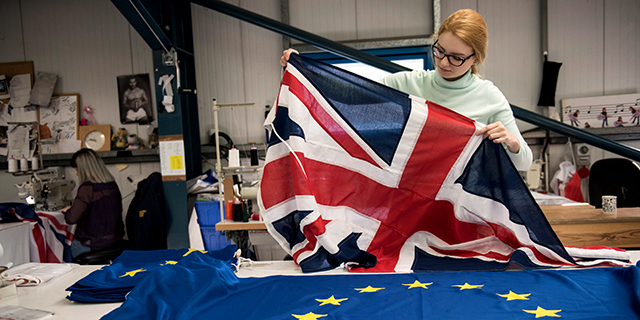 The UK’s relationship with the rest of Europe has been the source of recent political upheaval in London as the nation prepares for its voter-approved departure from the EU – commonly known as Brexit – in March 2019. UK political leaders are divided over several proposals related to the exit, such as the establishment of a free-trade area between the UK and the EU, which would require the country to abide by EU rules and standards. In the Center’s new study – which is based on a survey conducted in the UK and seven other countries in late 2017 – British views of the EU vary significantly by age, education and ideology. In terms of the division of governing power, younger British adults are significantly less likely to say that some powers currently held by the EU should be returned to national governments. A majority (57%) of British adults younger than 30 say this, compared with 70% of those ages 30 to 49 and 82% of those 50 and older. Only 19% of 18- to 29-year-olds in the UK say they strongly believe that some powers currently held by the EU should be returned to individual countries. Those ages 50 and older are much more likely (63%) to strongly feel this way. Younger adults in the UK are also more likely than older ones to say membership in the EU has yielded economic benefits. Three-quarters of Britons ages 18 to 29 say EU membership has benefited the British economy, compared with 67% of people ages 30 to 49 and 52% of those 50 and older. Around half (53%) of adults younger than 30 say they strongly feel that EU membership has benefited the British economy, a larger share than for either older age group. When it comes to ideology, around eight-in-ten British adults with right-leaning political views (81%) want to see EU powers returned to national governments, versus 61% of those on the left. Right-leaning Britons are also significantly less likely to see economic benefits from EU membership than left-leaning British adults (56% vs. 76%, respectively). Roughly three-quarters (74%) of UK adults with secondary education or less say they want some EU powers returned, compared with about two-thirds (68%) of people with education beyond secondary school. British adults with less education are also not as likely to see economic benefits stemming from the EU; 55% of those with no education beyond secondary school say the EU benefits the UK economically, compared with around three-quarters (76%) of those with more than secondary education. In the past, people in the UK have also expressed mixed feelings about Brexit and the EU. A spring 2017 Pew Research Center survey found that nearly half (48%) believed the exit will be bad for the UK, compared with nearly as many (44%) who said the decision to leave the EU will benefit the country.